The last six months have seen a clutch of beers and ciders taken off shelves across Australia for quality-related issues. In November last year, Newstead’s Johnno Apple Cider was recalled due to concerns that secondary fermentation might cause cans to burst, a process Moon Dog then went through in January when the same issue affected bottles of Son of a Plum. While an exploding can or bottle comes with obvious safety risks, brewers might also pull a beer from sale because it’s not up to scratch. 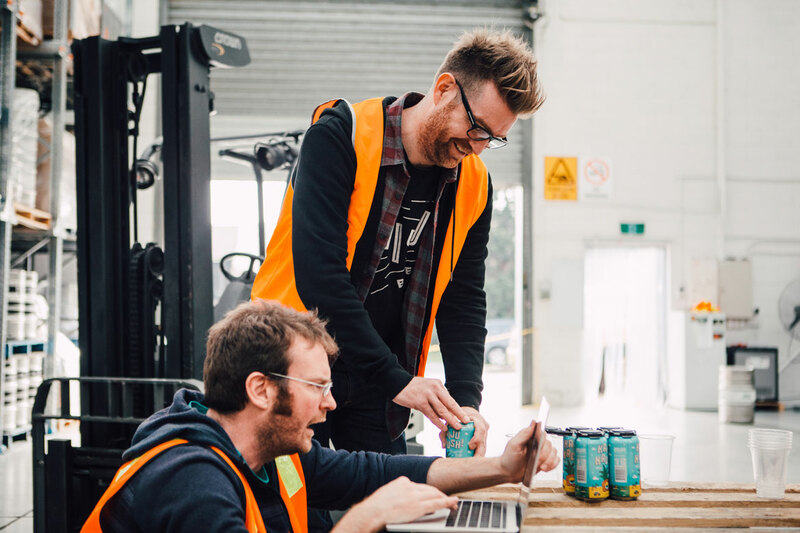 Last month, cans of the latest batch of Rocky Ridge’s hugely popular Rock Juice were withdrawn from sale because the beer was under-carbonated and not up to the standard the brewery’s owner, Hamish Coates, had set for the hazy IPA. In many cases where the issue is substandard rather than potentially dangerous products, the producer may not even go public with their decision to withdraw a product. Yet, as the local beer industry grows and more beers featuring new ingredients and ever-evolving techniques are released, there’s a good chance product withdrawals will become more regular. So is it something the craft beer community should worry about? And how does a business best deal with such unwanted complications? “We are all part of the one ecosystem,” says Diarmaid O’Mordha, quality and sustainability manager at Endeavour Drinks Group (EDG), which owns Dan Murphy’s and BWS and sells more craft beer than anyone else in Australia. 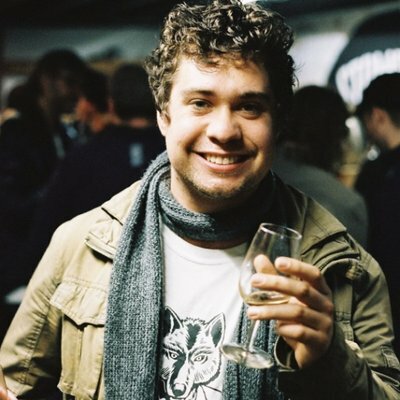 Withdrawing stock was a situation faced by KAIJU!’s Callum Reeves last month after a can of Golden Axe cider burst in the hands of a Melbourne bar manager. It led them to issue a late night post across KAIJU! and Golden Axe social media channels telling customers to return any cider from that batch of cans – best before date 03/12/20 – and start a hunt for any that might remain in the wild. Believing the liquid in the can had refermented led Callum and brother and business partner Nat to move quickly to ensure no more stock was being sold. KAIJU! brothers Nat and Callum Reeve. “It’s not a situation I want to be in again,” Callum says. Though both terms might be used interchangeably, withdrawals and recalls have specific meanings in production and retail. Withdrawals can occur for any number of reasons, from a product not tasting how it should – for example, an under-carbonated beer – or a fault in packaging. Recalls deal directly with health and safety matters and must be reported to the Australian Competition and Consumer Commission (ACCC). Both the ACCC and Food Standards Australia and New Zealand (FSANZ) outline the process for recalling products. They can be found here and here and are something brewery owners should be aware of due to the potential consequences. After all, recalls don’t just have the potential to damage a brewery’s reputation; injuries caused by faulty products and not following an effective recall procedure can potentially land breweries in court. Another recent product withdrawal came from West Australia’s Beerfarm. The Margaret River region brewery regularly releases seasonals and one-offs containing fruit as they look to celebrate their surrounds, often partnering with other local producers. Last month, the brewery announced they would be withdrawing Pineapple, a Berliner Weisse featuring fresh pineapple juice – a decision head brewer Josh Thomas says was made quickly. Inside Beerfarm's WA brewery where they've introduced new procedures since the recent Pineapple withdrawal. Though he says withdrawing a beer from sale is the hardest decision for a brewer to make – particularly as the cans they withdrew were still tasting great, according to the brewer – it’s an essential one if you find a fault. In the case of Beerfarm, it’s also led Josh to introduce new quality procedures in the brewery to mitigate any future risks. “We’ve added in a force ferment after we’ve added fruit to ensure it’s attenuated all the way,” Josh says. “We’re also doing forced ageing on packaging products; putting cans in a warm water bath and leaving it in for two or three days and that gives you a representation of what six months of ageing is like, and it’s generally a good way to pick up any micro issues early on. “Then, of course, there’s monitoring yeast health: once we do add the fruit to make sure the yeast is healthy enough to ferment through the fruit. Secondary fermentation can occur in cider and beers loaded with fruit as both can contain residual sugars that can activate yeast or certain microbes. It’s an issue that’s been noted in other craft beer markets, where the growth of experimentation and a lack of pasteurisation has seen secondary fermentation occur on a number occasions. Indeed, conversations around beer stability often lead into debates about the pros and cons of pasteurisation. It’s something to which Diarmaid has paid close attention. 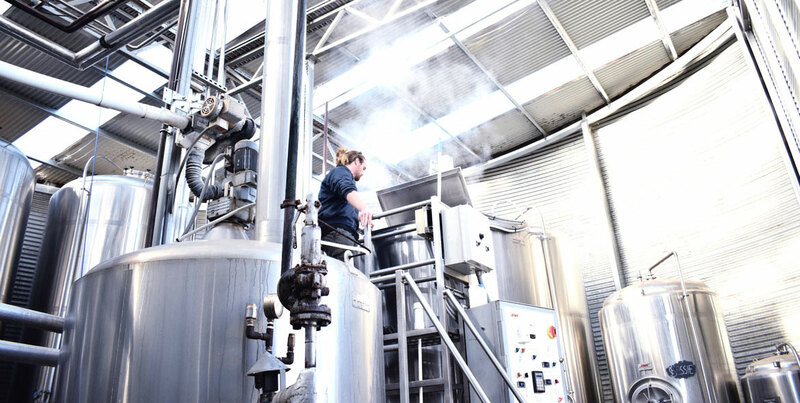 He says Australia’s beer industry went decades without any instances of secondary fermentation because pasteurisation was a process the largest brewers follow. “I’ve got to be clear: I’m not an advocate for pasteurisation,” says Diarmaid, whose former career as a brewer with a background in microbiology gives him a comprehensive knowledge of brewing science. 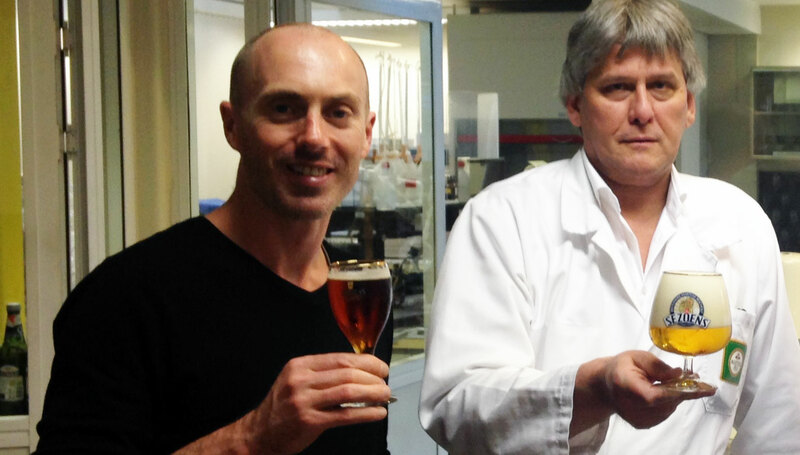 Endeavour Drinks Group's quality and sustainability manager Diarmaid O'Mordha (left) with Fons Marten of Belgium's Martens brewery. Louis Pasteur first started heating up booze to kill off bacteria more than a century ago. And, while Diarmaid says pasteurisation isn’t essential for brewers, if you plan to release unpasteurised beer or cider, there's a need to understand what can happen once it’s out in the world. “You’ve got to go off and learn about microbiology,” he says. “You’ve got to understand all your ingredients and you’ve got to understand all the things throughout history that have botched up brewing. It’s not a path they want to travel at KAIJU!, preferring to rely on other methods and technology, including the installation of a Velcorin system for Golden Axe cider that acts as a cold sterilisation method to break down residual yeast, bacteria and mould that can cause grief post-fermentation. Although ordered prior to the recent withdrawal, it wasn't in operation for the batch in question. Josh, meanwhile, says there’s a long list of processes brewers can enact as preventative measures and suggests breweries need to look at how they can improve their brewing. Such intentions will likely be well received by Diarmaid, who is concerned by the level of knowledge he’s found in some brewers. He says he’s reported cases of diastaticus – a variant of brewer’s yeast that can cause beer to referment – to brewers who didn’t even know what the microbe was, let alone how to look for it. “If the product’s not 100 percent safe we’ll never put that out in the market. Breweries need to have that same mindset,” Diarmaid says, adding that the legal consequences from mishandling a recall can be severe, particularly for small business owners who might have put their house on the line to follow their dream. What’s more, he questions why Dan Murphy’s would want to work with any brewer that doesn’t have quality at the forefront of their operation. “If somebody demonstrates they don’t give a damn about the customer then we don’t want to work with them,” he says. “We’ll be taking steps ourselves in how we work with suppliers and we have to because our responsibility is to our customers. We have partnerships with the people we work with but the people we work with have to be responsible. What’s more, Diarmaid believes having the ACCC or media focusing on product recalls is far from the sort of attention the craft beer industry either wants or needs. “If I heard that I could pick up a can of craft beer and it could explode and there’s reports of injuries and it’s in the newspaper, there’s that likelihood that I’m going to go, ‘It’s not worth the risk.’,” he says. As for solutions, Diarmaid says one answer is making sure the industry shares information and focuses on better educating itself. 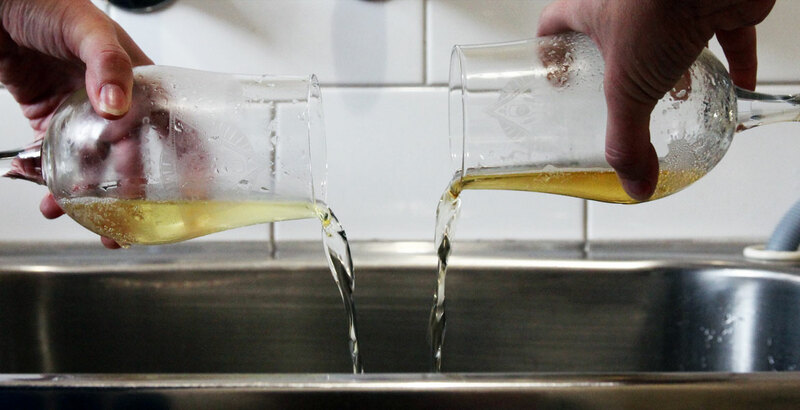 He points to the growing number of courses available as an encouraging sign and believes, as the industry body, the Independent Brewers Association should be focusing on helping brewers learn more about beer faults. It’s a view reflected by Callum, who says better communication between breweries and stronger education practices can help the industry meet challenges. What’s more, if handled well, such issues can present the businesses in question – and, by association, the wider industry – in a positive light. In the case of recent withdrawals and recalls, breweries’ communications have received praise from fans online. “You should go into politics, they need this honesty – as refreshing as the cider” was the response from one commenter on social media when Johnno was recalled by Newstead. For other articles in our Big Issue series, head here.